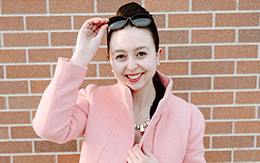 I bought my first coat from J.Crew Factory last month and it’s definitely a bright coat for a bright new year! Here’s an in-depth City Coat review + whether or not this is the winter coat for you. Why do I need a J.Crew Factory City Coat? For starters, it’s the budget-friendly version of the Cocoon coat from the main J.Crew line, which is made of Italian wool but retails for over $200. 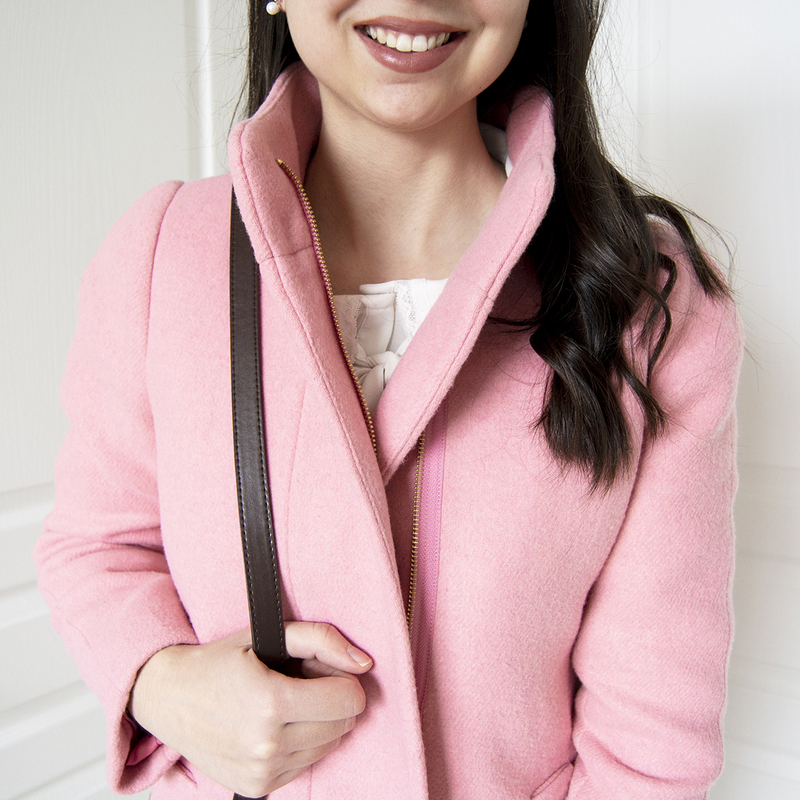 It’s gorgeous, but girlfriend doesn’t have that kind of cash to drop on a coat – so instead, I found the City Coat from J.Crew Factory which has a very similar style and color selection, but for a third of the price! I paid $49 for mine on clearance which is such a steal. It’s a beautiful baby pink color that has gotten me more compliments than I can count! I’ll be real…ordering the right size is tricky. If you can find one in store to try one, I highly recommend it. For reference, I’m 115 pounds, 5 feet 5 inches with a 27 inch waist and size 00 fits perfectly. It’s a little tight when I wear blazers or thick sweaters underneath, but it’s not boxy or unflattering on me. I know the pink color is enticing, but it looks like I’m losing hair at a rapid pace. The fabric of this coat attracts hair like nothing I’ve ever seen before and I have to take a lint roller to it daily to clean it. 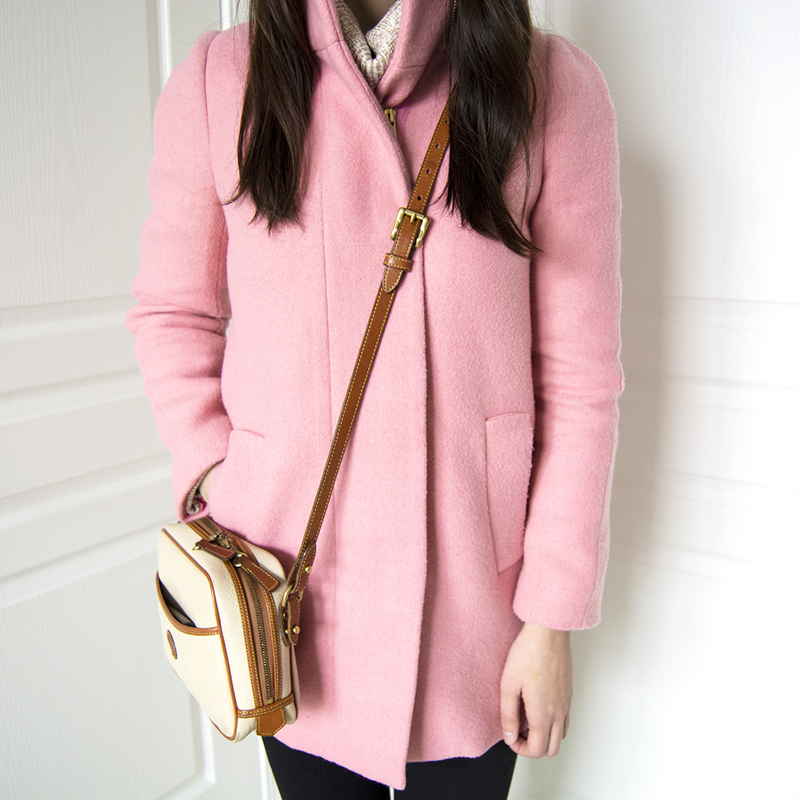 However, it is the perfect coat if you’re taking a trip in the fall to Boston! It’s not the warmest coat ever but it’s perfect for those mild winter days when you don’t want to break out your down coat that’s basically for apocalyptic blizzards. I’m so glad I added this to my wardrobe! 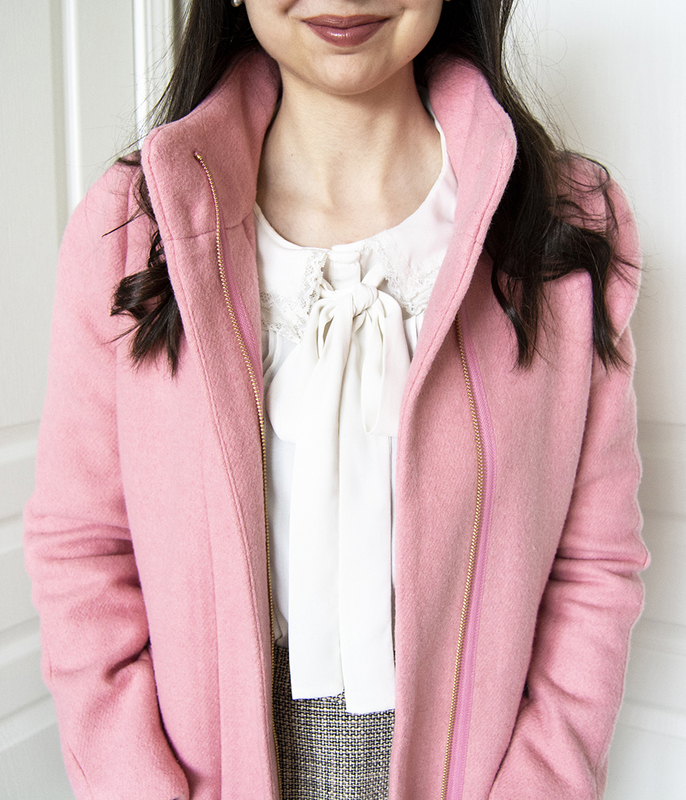 It’s the perfect “everyday” coat that’s classy, elegant and effortless. Throw on some lipstick, pearls and Hunter boots, and you’re ready for the day! If my City Coat review doesn’t convince you otherwise…you at least need to try it on in stores and see for yourself. This coat is a dream! I love it!